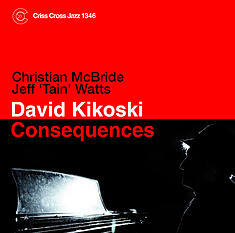 On his ninth Criss Cross date as a leader (and 22nd label appearance overall), pianist David Kikoski convenes an extraordinary trio with two famed and longstanding allies, bassist Christian McBride and drummer Jeff "Tain" Watts. It's no stretch to say that a lineup like this is guaranteed to swing - and it does, on a set of finely wrought Kikoski originals, including the two-part title track Consequences. Watts' own uptempo Mr. JJ and slow-grooving Blue Tain round out the set, and Kikoski ends with a poetic solo-piano take of Never Let Me Go . Complex, elegant and bluesy, Consequences is an essential item in Kikoski's growing oeuvre.